This past week I thought I would try again with Miss Oh and letters. She knows their names and most of the sounds. We play I Spy to help with sound recognition and for fun, but other than that and the odd bit of writing Miss Oh is just not that bothered about them. It isn’t a great concern to me. She likes books and having stories. She likes me to point out the words. She even asks me to write messages for her to copy, especially for cards she makes. So it isn’t as though she is totally disinterested. But I thought I would give it another nudge with a different game. This is a home made alternative to the Object Boxes. 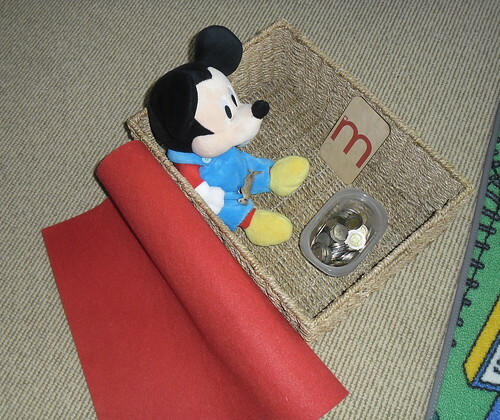 For those unfamiliar with this aspect of Montessori, here is a link to some details about it and a working example of someone using it. Now I don’t have the luxury of access to lots of miniature objects. Cost and actual existence of them being the main issues. Unlike our American cousins we simply don’t have the population base to stock lots of these little knick-knack toys and at a tiny cost too. 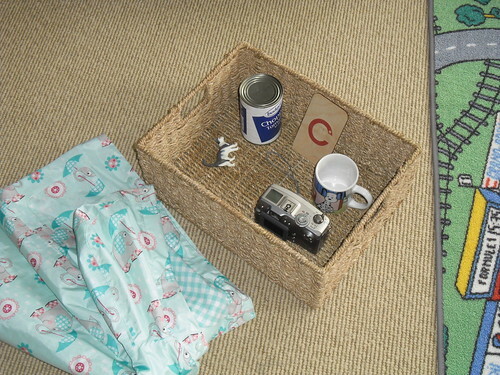 So, my home made version was part I Spy, Treasure Hunt and Object Box. 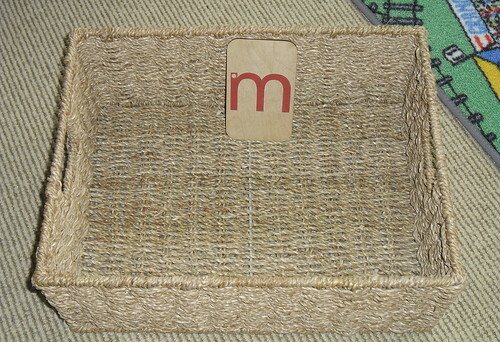 I took a medium sized basket and added one of the sandpaper letters to it. Then Miss Oh was asked to go find 5 objects from around the house that started with the “muh” sound. And this is what she brought back. And for those of you who can count, yes there are only 4 objects. I would be the fifth, but it is hard to be in and take the photograph at the same time without a tripod. We took turn about. Miss Oh chose another of the starting letters (c, m, a, t) for me to find, and it made me more aware of how difficult the game can be, despite obviously knowing a large number of nouns. And here is her other effort, the C box. She really enjoyed this, so it will be on the list of games to continue to play while Master Oh is having his middle of the day siesta. What games do you play for fun that helps your kids learn about their language? Such a creative idea ! What would you recommend for a 4 month-old baby? Thank you ! I will be following your blog from now on ! Can’t wait to do those fun games with my daughter ! Welcome and thanks for taking time to leave a comment. Babies are a whole different story. I didn’t really “do” much other than a lot of interaction with my little ones, and provide the usual small toys that they could hold and look at. If you like the idea of Montessori and are happy to adapt it to meet your family’s needs (like I do), then you can’t go past Sew Liberated. You may have to go back into her archives, but she has the most amazing room layout for little ones, amongst other things. I really must get her blog back into my sidebar….off to do that now. Thanks so much ! I just visited her blog and I loved it 🙂 – very resourceful !